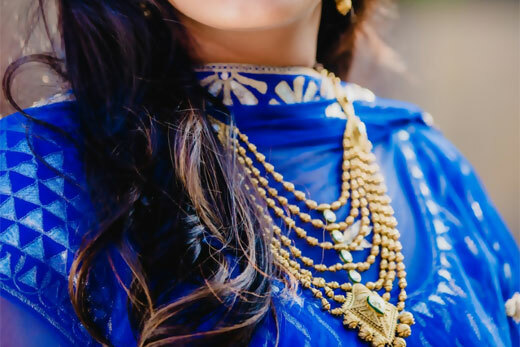 Luxury marries bold accent abound in the royal hues of blue as this classic bridal statement is given a contemporary flair with a geometric Azva handcrafted gold haar. 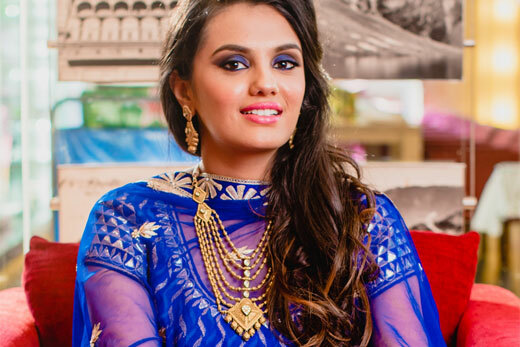 Wedding Sutra bride to be Nidhi�s transformation is strikingly glamorous with intricate engravings on the diamond shaped pendant and radiating strands of beads. With earrings in the diamond motif finished with a kundan centre and chased drops a kundan floral ring makes for a covetable trousseau. Her eyes are defined and accentuated with a matching shade of blue and bright pink lips for a feminine elegance. Long locks played up with deep layers create an indulgent modern look ideal for that sangeet soiree.